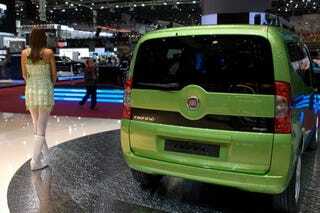 We've already seen the new Fiat Fiorino delivery van and now we have pics of the passenger version. The new version carries over the same general look from the front as the Citroen Nemo and Peugeot Bipper, which are essentially the same vehicle. From the side the blackened C-Pillar and raked window design clearly differentiate it from its platform partners. Speaking of platform partners, how tall is that booth model?